Clemson is back home in South Carolina after winning the national championship. Thousands of fans met the team on campus late Tuesday night, and coach Dabo Swinney promised them a week of celebrations ending with a parade for the champions on Saturday. The Tigers beat Alabama 44-16 on Monday night to win their third national championship and second in the past three seasons. Swinney bragged about his team's academic accomplishments and several players thanked the fans for their support, including freshman quarterback Trevor Lawrence. The parade Saturday morning will end in Memorial Stadium just before the Clemson men's basketball team plays No. 4 Virginia. The Tigers' plane was given a water cannon salute as it landed at the airport near Greenville. The Clemson flag is flying over the South Carolina State House after the Tigers' national championship win over Alabama. The flag was also atop the capital's dome two years back when Clemson won the crown. Clemson will have a parade and fan celebration at campus and the football stadium Saturday. The state has traditionally flown school flags to celebrate national title teams. The South Carolina college flag flew after the school's two College World Series wins in 2010 and 2011, and women's basketball's NCAA Tournament title in 2017. The Coastal Carolina flag flew over the capital after winning the College World Series in 2016. President Donald Trump is congratulating Clemson for winning the national championship with a 44-16 win over Alabama. In a tweet , Trump called the Tigers "a truly great football team" that pulled off an "an incredible win last night against a powerful Alabama team." Trump also called it a big win for South Carolina. On Monday night, former South Carolina Gov. and former U.S. ambassador to the United Nations Nikki Haley was on the Clemson sideline before the game. She is a Clemson graduate who resigned as ambassador effective Dec. 31. Trump says he was looking forward to seeing Clemson and coach Dabo Swinney for a second time at the White House. The Tigers visited in 2017 after their championship run the previous season. Clemson will celebrate its latest national title with a parade and ceremony on Saturday. The school said the parade will start at 9 a.m. Eastern before ending at the Tigers stadium, where coach Dabo Swinney and several players are expected to speak. After Clemson won the championship two years ago, fans filled much of the upper deck of the stadium, which seats 81,500. The Tigers (15-0) should get another big crowd to cheer on the team after its decisive, 44-16 victory over defending champion Alabama on Monday night. It was the Tigers' second national crown in three years —both coming over Alabama— and third in program history. Trevor Lawrence threw for 347 yards and three touchdowns to lead No. 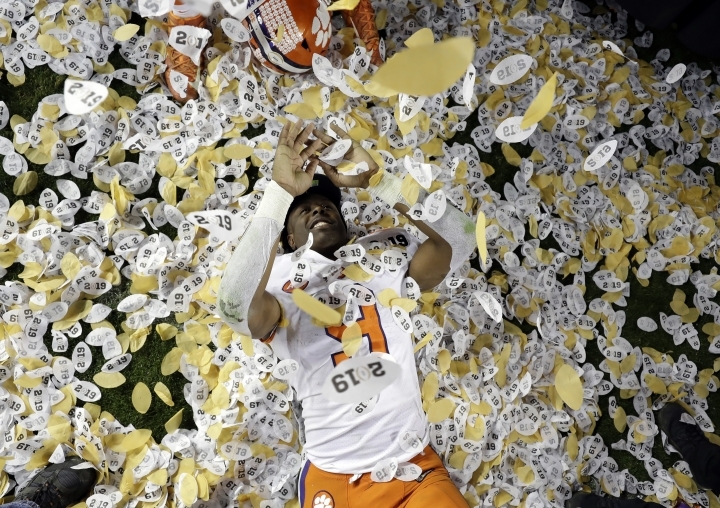 2 Clemson to its second national title in three years with a 44-16 rout of No. 1 Alabama in the College Football Championship title game. Lawrence threw TD passes to Travis Etienne, Tee Higgins and Justyn Ross to help undefeated Clemson become the first team in the AP poll era starting in 1936 to win 15 games in a season. Coach Dabo Swinney's squad beat Nick Saban and Alabama (14-1) for the second time in three meetings in the CFP title game. A.J. Terrell had an interception return for a touchdown for Clemson on Alabama's opening drive. Heisman Trophy runner-up Tua Tagovailoa threw another interception and the Tide suffered their most lopsided loss ever under coach Nick Saban. Trevor Lawrence threw his third touchdown pass of the game to give Clemson a 44-16 lead going into the fourth quarter of the national championship game. The Tigers scored 30 straight points after falling behind 16-14 and are one quarter away from winning their second national title in the past three seasons under coach Dabo Swinney. Lawrence has thrown for 347 yards, with 153 of them going to fellow freshman Justyn Ross. Ross has 301 yards receiving in two playoff games, including a spectacular one-handed grab that helped set up the latest touchdown. Alabama has never lost a game by more than 14 points since coach Nick Saban arrived in 2007. Trevor Lawrence threw a 74-yard touchdown pass to Justyn Ross three plays after Clemson stopped Alabama on a fake field goal attempt to give the Tigers a 37-16 lead in the third quarter of the national championship game. Ross got loose for the big play after cornerback Saivion Smith went down with an injury to put the Tigers in control. It was a dramatic turnaround after Mark Fields broke up a third-down pass that led to Alabama sending out the field goal unit on the opening drive of the second half. Coach Nick Saban called for a fake but holder Mac Jones was stopped for a 2-yard loss on a fourth-and-6 run up the middle. This is the fourth straight year these teams have met in the playoff with Alabama winning the title game at the end of the 2015 season, Clemson winning the championship the following year and the Crimson Tide winning a semifinal matchup at the Sugar Bowl last season. The winner will become the first school in the AP poll era to finish a season 15-0. Travis Etienne scored three TDs in the first half as Clemson took a 31-16 halftime lead over Alabama in the CFP title game. The Tigers matched the most points scored in the first half against the Crimson Tide since Nick Saban became coach in 2007. Oklahoma also scored 31 in the 2014 Sugar Bowl. Etienne ran for two scores and also caught a 5-yard TD pass from Trevor Lawrence following Tua Tagovailoa's second interception of the game. The Tigers opened the scoring with a 44-yard interception return for a TD by A.J. Terrell on Alabama's opening play. Tagovailoa recovered to throw two TD passes to put the Crimson Tide up 16-14 before the Tigers scored the final 17 points of the half to hand Alabama its biggest deficit of the season. Tagovailoa threw deep into coverage midway through the second quarter only to have Trayvon Mullen come up with the interception. The Tigers then drove 47 yards to score on a 5-yard TD pass from Trevor Lawrence to Travis Etienne. Etienne earlier ran for two touchdowns. The Tigers also scored on a pick-six by A.J. Terrell. Tagovailoa came into the game with only four interceptions all season. He is 12 for 15 for 153 yards and two TDs for Alabama in the first half. Joseph Bulovas kicked a 25-yard field goal in the opening minute of the second quarter to give Alabama a 16-14 lead over Clemson in the CFP championship game. Alabama had to settle for the short field goal after Damien Harris was stopped for a 4-yard loss on third-and-goal from the 3. Bulovas came on and made the field goal after missing an extra point earlier in the game. It was an exhilarating opening quarter, with the teams combining for four touchdowns in the opening 8:27 of the game with a run of big plays that started when Tua Tagovailoa threw a pick-six to A.J. Terrell on Alabama's opening drive. Tagovailoa bounced back with a pair of TD passes, a 62-yarder to Jerry Jeudy and a 1-yarder to Hale Hentges and drove the Crimson Tide into position for another score in the opening minute of the second quarter. He was 12 for 14 for 153 yards. Trevor Lawrence wasn't nearly as efficient for Clemson but did throw a 62-yard pass to Tee Higgins that set up Travis Etienne's 17-yard TD run. Clemson didn't take long to answer Alabama's touchdown thanks to a 62-yard pass of its own. After Tua Tagovailoa tied the CFP title game for the Crimson Tide with a deep pass to Jerry Jeudy, Trevor Lawrence delivered one of his own on a third down to Tee Higgins. Travis Etienne scored on a 17-yard run on the next play to give Clemson a 14-7 lead just 4:25 into the game. The Tigers also scored on a pick-six by A.J. Terrell as the teams combined for three TDs in a span of 2:45. Tua Tagovailoa didn't take long to make up for his rare early mistake. Three plays after throwing a pick-six on Alabama's opening drive, Tagovailoa threw a perfectly placed deep ball that hit Jerry Jeudy in stride for a 62-yard touchdown catch that tied the game at 7. That gave Clemson and Alabama touchdowns in less than three minutes in the CFP title game. Clemson has scored first in the CFP title game thanks to its defense. On Alabama's third play from scrimmage, Tua Tagovailoa threw off-target on a pass that A.J. Terrell intercepted and returned 44 yards for the game's opening score. The Crimson Tide normally are fast starters with TDs on the opening possession 11 times in the first 14 games and outscoring the opposition 210-45 in the opening quarter. The Tigers had gone three and out on their first possession. The College Football Playoff title game between No. 1 Alabama and No. 2 Clemson is underway. The Crimson Tide kicked off to start the game between the undefeated foes vying to become the first school in the AP poll era to finish a season 15-0. This is the fourth straight year these teams have met in the playoff with Alabama winning the title game at the end of the 2015 season, Clemson winning the championship the following year and the Crimson Tide winning a semifinal matchup at the Sugar Bowl last season. Most of the seats are filled at Levi's Stadium with Clemson appearing to have more fans in attendance. Alabama linebacker Christian Miller is testing out his injured hamstring during pregame warmups of the CFP title game. Miller is questionable to play for the top-ranked Crimson Tide in the championship game against Clemson. Miller is a key part of Alabama's defense with 8 1/2 sacks this season. Nikki Haley, former U.S. ambassador to the United Nations, was on the Clemson sideline before the national championship game with Alabama. Her presence is not surprising: Haley is a Clemson graduate and was governor of South Carolina from 2010 until her appointment to the UN by President Donald Trump in January 2017. She resigned her post last year, leaving office on Dec. 31. Haley posed for pictures with Clemson supporters and spoke for a few minutes with Southeastern Conference Commissioner Greg Sankey. Even though her Tigers have split a pair of championship contests with the Crimson Tide, this is Haley's first time watching in person. "I had been working," she said with a smile. The College Football Playoff is not close to expanding. After a month of chatter about possible changes to the four-team playoff, the conference commissioners and university presidents who constitute the playoff brain trust met Monday at the Fairmont Hotel in downtown San Jose and quelled the speculation. Mississippi State University President Mark Keenum said in a statement it was "way too soon" to know if expansion of the format to include more participants was even a possibility. The playoff is in its fifth season. No. 1 Alabama and No. 2 Clemson will play in the national championship game Monday night at Levi's Stadium in Santa Clara. Keenum told reporters the consensus was "very pleased" with the current four-team setup. He said there was discussion about ways to improve the playoff.